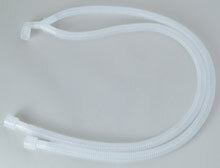 The open ends of each hose are fitted with standard 22mm female connectors, designed to push onto any standard anesthesia machine inhalation and exhalation ports. Y-piece has a 22mm OD and 15mm ID connection. Two 36" long X 5/8" ID. Two 48" long X 1" ID.